民話「アマガエルのヒミツ」を英訳してみました： Yoshy tried to translate an old folk-tale, “Tree-frog’s Secret”. 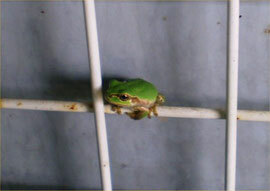 When many plants begin growing in LL-garden, many Japanese tree-frogs visit even LL Shihoya Arai School. Yoshy tried to translate this old folk-tale which is famous to many places in Japan into English. Once upon a time, there lived two tree-frogs who were Father-frog and his Son in a certain place. The son-frog was so perverse that he was always doing the opposite against his father’s orders. Just before Father’s death, he wanted his son to build his tomb on the top of a hill not to be flown away by a flood. Father said to his son, “I ask you to build my tomb beside a stream” and he died. Unexpectedly, this son reflected himself about his bad behavior, deciding “I had better obey Father’s last words.”, finally built his tomb at the side of a river. So the son has been crying saying, “My father’s tomb would be flown away,” they say.